Sunday March 14th 1920 I took a ride with Rob in forenoon. I read some in afternoon but felt so home sick and lonesome I cried most of the time. The folks were invited out to supper. I went to bed early. Monday March 15th 1920 I did not sleep much last night. Still had headache this morning so did not get up till noon. Hattie to town in forenoon. Cora got the dinner. I crotcheted in afternoon and evening. Hattie home to get the supper early. Cora to town with Rob. 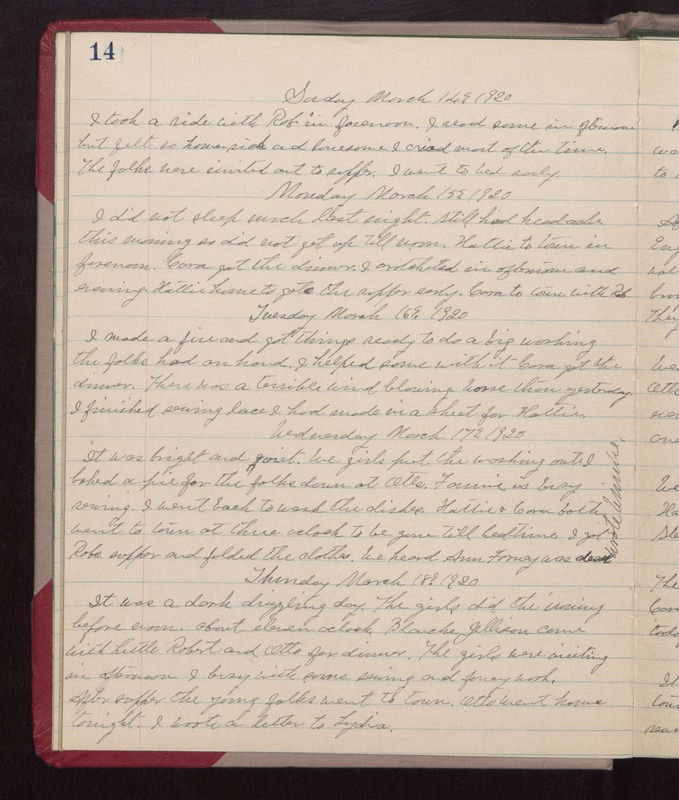 Tuesday March 16th 1920 I made a fire and got things ready to do a big washing the folks had on hand. I helped some with it. Cora got the dinner. There was a terrible wind blowing worse than yesterday. I finished sewing lace I had made in a sheet for Hattie. Wednesday March 17th 1920 It was bright and quiet. We girls put the washing out. I baked a pie for the folks down at Otts. Fannie is busy sewing. I went back to wash the dishes. Hattie & Cora both went to town at three oclock to be gone till bed-time. I got Robs supper and folded the clothes. We heard Ann Forney was dead. Wrote Winnie.. Thursday March 18th 1920 It was a dark drizzling day. The girls did the ironing before noon. About eleven oclock Blanche Jellison came with Little Robert and Otto for dinner. The girls were visiting in afternoon. I busy with some sewing and fancy work. After supper the young folks went to town. Otto went home tonight. I wrote a letter to Lydia.